Any time I try to play a 810x540 video it quits out. I double click the video, it brings up the MPCStar player it goes to the 810x540 dimensions and then it just quits. This didnt happen at all with the older version of MPCStar. Does the same video work with other players like VLC? VLC? Does that mean like any other video player? Cause Windows media can play them. @_@ doi my bad xD VLC is another player. I wouldnt know dont have that player. But like I said they work with windows media player. Theres nothing special about the video file, its just like any other common video file I have in my comp. The MPCStar player just wont play 810x540 vids. VLC is a free download from Videolan.org. The important thing about it is that it does not use the system filters, so doesn't require that you have this one installed, or that one installed. It's a good thing to have for testing, and I think it's hands-down better than Media Player anyway. Digital video is very complex, and there are many, many different forms of it out there. The issue is probably not due to the particular size of the video, but with the way it's encoded. You haven't provided any information about that, so it's not really possible to offer any suggestions. Thats the thing, theres really nothing special about the vid im trying to play. Its a wmv just like any other wmv video I have in my computer. I got the newest MPCStar. The only differences my vids have is their resolution and type which could be avi, wmv, mpg ect. MPCStar player just wont play 810x540 videos. Anyways im gonna try VLC, ive been reading on it and it seems to be as good or maybe even better than MPCStar. Though I still hope someone can get back to me on this, on why MPCStar wont play 810x540. What he meant to say is that you need to open the video in MPCStar, hit Ctrl+I, copy&paste here everything you find in the new window. Theres just nothing special or different about these files im trying to play. They played on an older version of MPCStar. ...The only differences my vids have is their resolution and type which could be avi, wmv, mpg ect. Humm.... well, that's what you see and think. The avi, wmv, mpg, etc. containers may contain several types of video streams each. The resolution of the video stream is only one of its attributes (one of the more visible, yes, I'll give you that). But another very important attribute of a video file is the codec type which was used for encoding it. That's what you need to provide, to shed some light on this matter. You might wanna share the same info about the audio stream, too. Look, why would the files info matter(I know it would,but in this situation it doesnt seem logical since the same very exact file was playable in an older version of MPCStar)? Its a wmv plain and simple, why is it that an older version of MPCStar was able to play them(and by them I mean 810x540 vids) and the newer version cant? Its the same wmv video I played in the older version that Im trying to play in the newer version. Plus I cant even do the control I function on it cus the player closes right away. Edit: I wanna be more thorough about this but I have only tested this with wmv 810x540 vids and not with avi,mkv,mpg etc. They play just fine with Windows Media Player and with VLC. I dont see why MPCStar would have a problem playing them if even windows media player can. Well, let's put it this way: why would the particular video dimensions matter? They're all getting re-sized to fit the window anyway. It makes more sense to those of us with some experience of digital video, that the video dimensions are just incidental and that the real source of the trouble is the way the internal stream is encoded -- that the person who encoded it just happened to choose that video size while he was making errors in the encoding. But since you don't know and don't want to tell us, interest is fading fast. Why don't you try re-encoding it to the dimensions you like or believe will work? That probably won't prove anything, as chances are that the recoding will fix the issue if it succeeds at all, and the video dimensions will again be irrelevant. OTOH, you could try taking a known working video and recoding it to the suspect size, to see if that really, truly does make it unplayable. It's extremely unlikely, though. See, we think you're chasing a wild herring up the wrong redwood, but for some reason you won't provide any info about the video in order to look at far more likely causes. You seem obsessed with the video size, though you have little if any experience with digital video and no plausible theory about why that should cause any problem. You don't have enough history to clearly demonstrate a dimension-based problem, and it does seem like you don't want anybody to look closely enough to see if there's another cause. ...the same very exact file was playable in an older version of MPCStar)? Exactly. It played in an older version. Since this is a new one, it has a new player version and a new set of decoding filters which might just cause the problem. You keep saying it's a wmv plain and simple but the truth is there's nothing simple about video decoding. Don't be fooled by the appearances. In fact filter-graphs (the chain of decoding filters a player builds in order to render your video image) can get so complex that once you take a look at them you begin wondering how the heck did anything play at all, so far, on your system? MPCStar installs its own set of filters along with it, which might conflict with some of the older ones. The explanation for the crash occurring only in MPCStar is not very simple to give (it may use a custom graph which makes use of a conflicting filter). So, you see now, I hope, how the codec version might help. If you provide as much info as possible it might be easier to determine if it's a conflict matter or a bug and, given the case, to pass it to the development team. You can find out the codec info in WMP too; just open the file and choose File-->Properties. BTW what's your OS type? Alright well lets get right to it then. Well since I cant do the info check with MPCStar on this file because it closes right away, I tried it in WMP just like you said. 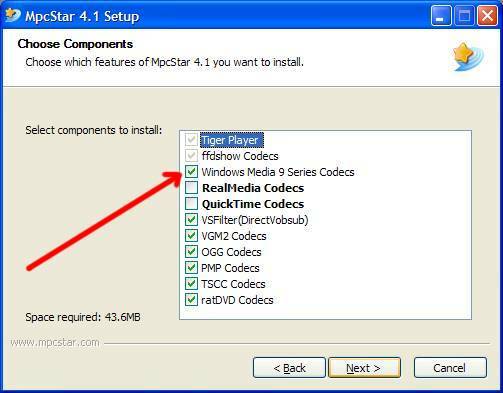 Well, a very quick way to verify one thing, it would be to uninstall MPCStar and reinstall it without the WMV9 series option. Then check again if you can run the file, both in MPCStar and in WMP and VLC and report back. Hmmmmm I uninstalled to reinstall and during the installation I couldnt find the WMV9 option to uncheck. Is it under a category during installion? Whoa O.o that codec doesnt even show up during my instalation. Installation package will check if Windows Media 9 Series Codecs is installed in your computer. This indicate your computer have successfully installed it. So next time, it will not show in your installation process. But even if I uninstall it shouldnt it uninstall the Windows Media 9 codec along with the other ones when I uninstall.. which could only mean that I had WIndows Media 9 Codecs installed in my comp in the first place right? Yes, that's the idea. But this way you will verify if your WMP, which was able to play the file, uses a different filter for decoding or if (the other case) the filter installed by MPCStar overwrote your previous one but just can't handle it properly. As I said, the digital video realm is very complex and there are no general solutions to give for a certain problem. Especially, since I don't have access to the files you are talking about and can't reproduce the error or run a more complex diagnose of the filter graph. So, the only thing that comes to my mind right now is a troubleshooting done by a trial and error method which will narrow the range of possible causes, more and more with every step. I'm no digital video guru either, so if you think you have a faster solution, feel free to try it. In this particular case though, there may be only the one filter for Windows Media 9, because it's not a very popular format. That's just not usually the case. If you have the time, you might seriously try transcoding the file to another encoding like XVid, and see if that solves your problems. I suggest you try the free Super converter from eRightSoft for this. It depends on your system, but transcoding takes time. It's idle time, you don't need to watch over it or anything, but you shouldn't be doing anything else heavier than websurfing while you do it. If you can leave it running overnight while you sleep, that's one way. It's infuriating to wake up to some simple modal error message waiting for an obvious answer, though. That happens too. Alright So how do I do it? Since I cant uncheck the box of Windows Media 9 codecs since it doesnt appear during my installation, what should I do? Donde, we test with some similar size video but do not find the problem. Could you please provide a link of the video so that we can download and test? Please dont close thread, I need to take care of a problem I have (and it it will take a 3 to 4 weeks) I'll try to post a link for you guys to get the file im trying to play. But for now I need to focus on this problem that has just occured(nothing with MPCStar). In the meantime, you could try rebuilding the file to see if that makes the issue vanish. If it does, then it's pretty clear that the file itself was the problem. I don't work with .wmv so I don't know for certain which tools will work with it, but you can try downloading and installing VirtualDub (it's freeware), and set it for direct stream copies of both audio and video, then save the file as another .wmv file. As I say, I never work with .wmv except to transcode out of it, so I don't even know if VirtualDub can read/write .wmv. But if it can't, you'll need to find a similar tool that can. Yeah i hear ya. But its like im too attached to MPCStar @_@.